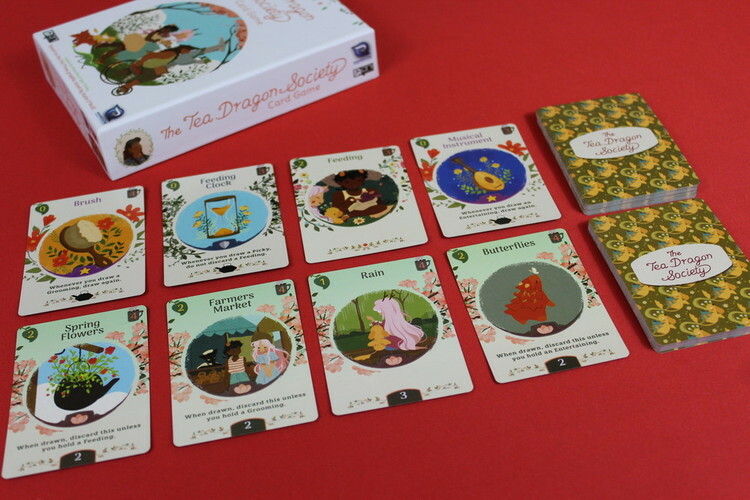 The Tea Dragon Society Card Game is based on a graphic novel by Katie O’Neill and I will start by saying I had never heard or seen it before. However, dragons are one of my favourite creatures and being English I, of course, like a good cup of Rosie Lee! Making this a game I had to take a look at. The enchanting artwork on the box draws you in and continues in the box with the lovely card art, even the inside of the box is beautiful. 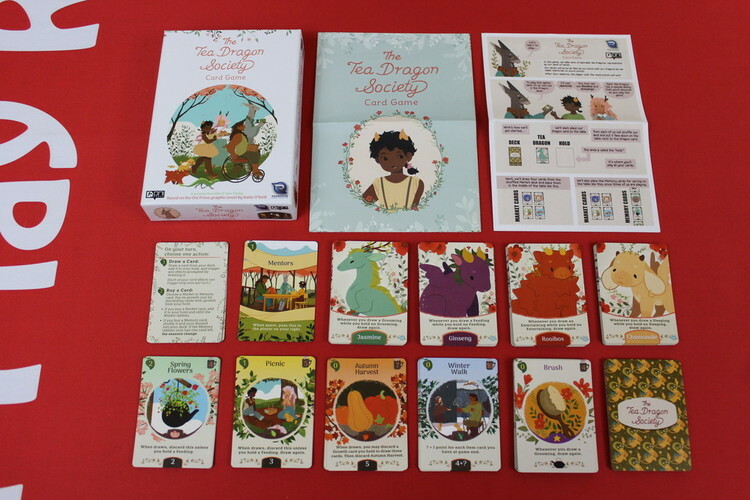 Each player takes a Tea Dragon of their choice and the matching starter deck (these are marked with ‘st’ in the bottom right hand corner) Return all unused Dragons and starter decks to the box. Place your Tea Dragon face up in front of you, next to your deck. Shuffle the market deck and reveal the top four cards, placing them face up in the middle of the table, these will be the market cards that are available to buy. Whenever a card is taken from here, immediately replace it. Shuffle up the four stacks of memory cards according to their season. Randomly remove cards from each season depending on the player count and put them back in the box (remove three cards from each season for two player, two from each season for three player and one from each season for four player) Place the Memory cards for Spring face up, under the market cards, set aside the cards for the other seasons for now. The cost of cards is shown in the top right hand corner of the card, in the mug. The ‘growth’ (your currency) is shown in the top left hand corner in the green leaf and the points you’ll get at game end is shown at the bottom in the middle of the card. The player teaching the game or the oldest player will go first (I like this as I’m usually both!) Give the Mentors card to the person on their right ie. the person going last. Draw a Card - Draw a card from your deck and place it face up in front of you. 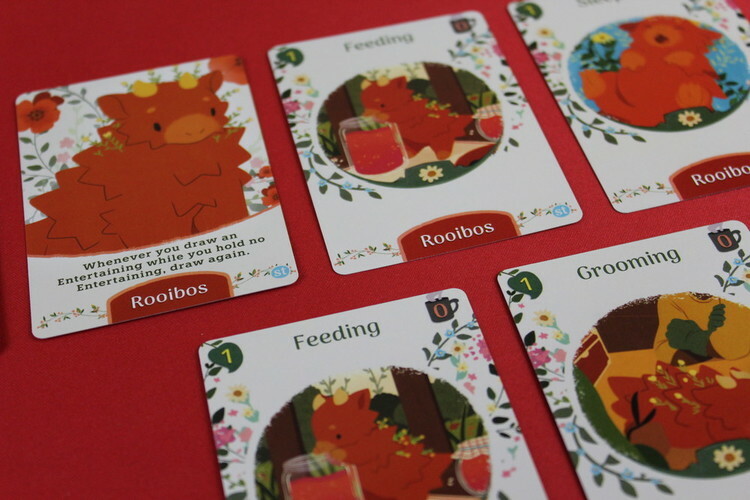 In this game, players do not have hands of cards, all cards are kept face up on the table in your ‘hold’. Trigger any effects that occur. If your draw pile is empty, shuffle your discard pile to form a new draw deck. Don’t forget your Tea Dragons special ability when drawing cards. Buy a Card from the Market - Discard cards from your hold with growth equal to or more than the cost of the card you want to buy. You don’t get change for overpaying and extra growth cannot be carried over to your next turn. When you buy a card from the market, place it face up in front of you, in your hold. Immediately replace the bought card with the top card from the deck. Be aware that two cards in the deck trigger an effect when they are revealed - Brick and Fickle Dragons. If at any point, the market deck is empty reshuffle the discard pile to form a new deck. Buy a Memory Card - To buy a Memory Card you must discard cards the same way as when buying a market card. However, when you buy a Memory Card, place it in your discard pile then shuffle your discard pile with your deck to form a new deck. Then, if only one Memory Card remains in the tableau, change the season. To do this first, discard the remaining Memory Card and flip over all of the Memory Cards for the new season. Discard the four available market cards and replace them with new cards from the market deck. If you use the Mentors card at any point to pay for a card don’t discard this - pass it onto the player on your right. The game ends when there is only one Memory Card left in the Winter Season. Players add up their points and the one with the most is the winner! 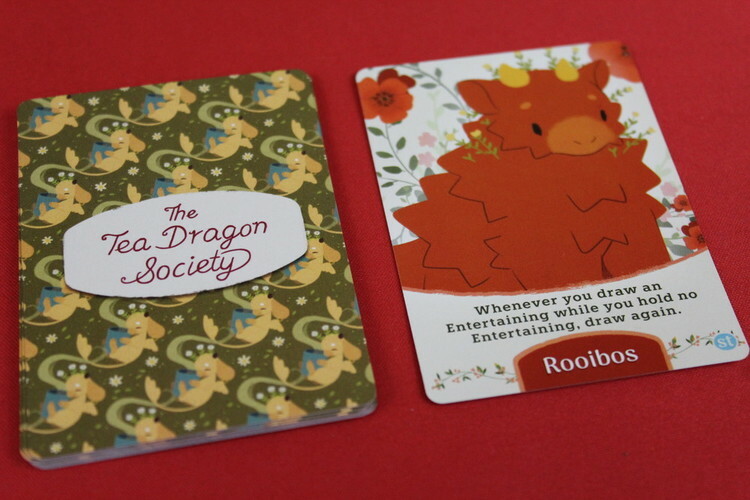 The Tea Dragon Society Card Game is a super cute deck builder for beginners. 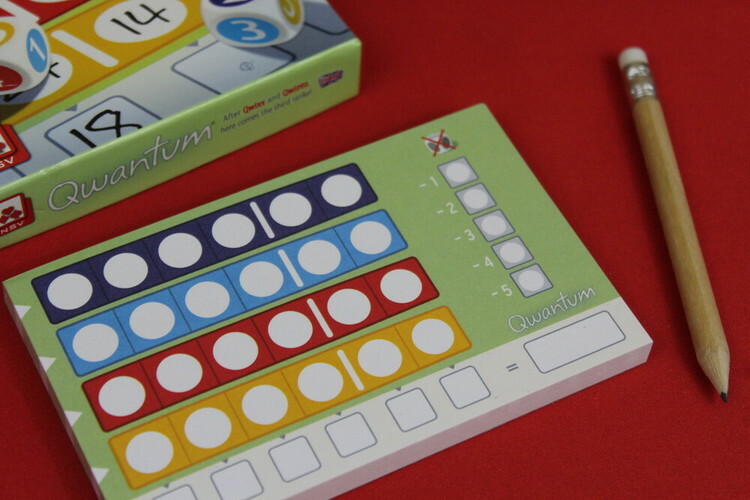 Having open information and not a huge amount of text would make this a great game for kids, especially when you combine it with the artwork and easy to grasp iconography. 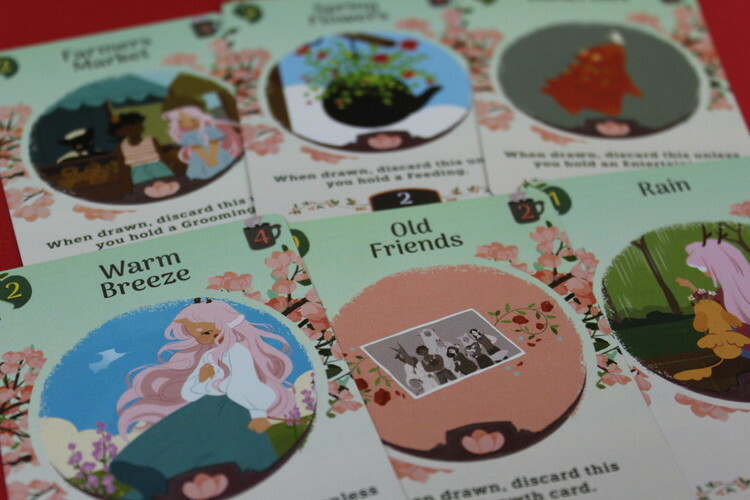 Each player starts with four ‘mischief’ cards in their deck which will force you to discard growth cards meaning there can be an element of push your luck when drawing, do you draw a card to try and buy that Memory Card and risk losing cards from your hold instead? 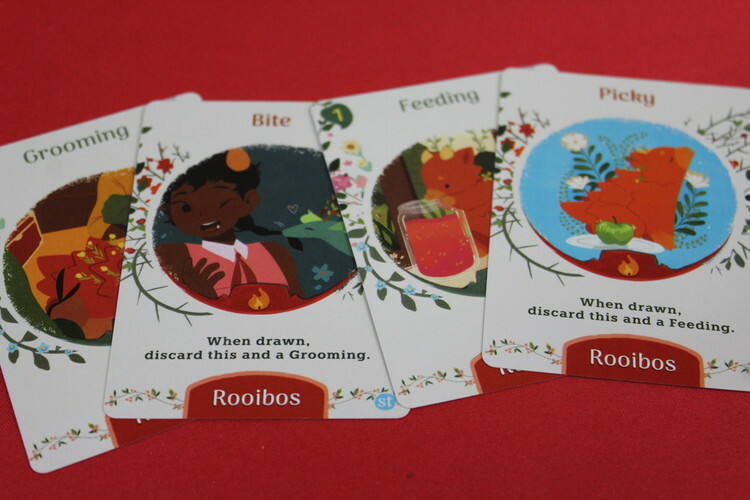 Sadly, the theme didn’t shine as much as I wanted it to, the specific Tea Dragon abilities felt very ‘samey’ and the feeding, grooming, sleeping cards were just a name rather than a specific action that made you feel like you were taking care of your Tea Dragon. This is, however, a great filler or introduction to deck building that would draw anyone in. Review copy provided by Renegade Games.